Sloto Cash Casino is a wonderful ambling platform established in 2007 and owned by DeckMedia N.V. Casinos. The casino has an appealing bight and friendly user interface with a wide collection of games to choose from. All players who have used this platform recommend it for its enhanced security and fair game results. Sloto Cash casino is a legitimate casino service provider since it holds a license from Curacao eGaming. Furthermore, the site is available in instant play and as well as through a downloadable software. The primary game supplier at Sloto Cash is Realtime Gaming (RTG). The latter is reputable in using cutting-edge technology in ensuring that the games are of unparalleled quality as well as cross-compatible. Their games are also characterized by stunning graphics and generous bonus offers. Using HTML5 technology, RTG has been able to offers games which are compatible with leading mobile phones including iOS, Android, Windows, and Blackberry. Sloto Cash Casino offers players with more than 150 different game variations including table games, cards, slots and a live dealer. All games are available for download, instant play and mobile platforms with equal quality of graphics and loading speed. And as the name suggests, the lobby is dominated by exclusive online slot varieties. Online Slots: Cash Bandits, Samba Sunset, Eternal Love, Pirate Isle, Zhanshi, Ghost Ship, and Enchanted Garden. Table Games: Tri Card Poker, Pontoon, Face Up, Caribbean Hold ’em Poker, Baccarat, Pai Gow Poker, and Suit em up Blackjack. There is a welcome package for all new players comprising of 200% welcome bonus plus 100 free spins on particular slot games. There are weekly, cashback, and monthly promotions as well as a loyalty program where players can earn comp points. The bonuses come with promo codes and are available on all games. 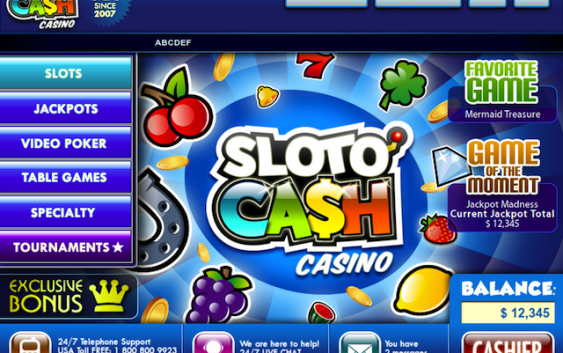 Sloto Cash Casino accepts players to withdraw and deposit their funds using the following methods, Skrill, Neteller, American Express, Bank Transfer, Mastercard, Visa, Bitcoin and ECO Card. There is a friendly and reliable team of support agent at Sloto Cash working around the clock to ensure that your questions are answered via email, phone and live chat.